A flexible spending account (FSA), also known as a flexible spending arrangement, is one of a number of tax-advantaged financial accounts that can be set up through a cafeteria plan of an employer in the United States. An FSA allows an employee to set aside a portion of earnings to pay for qualified expenses as established in the cafeteria plan, most commonly for medical expenses but often for dependent care or other expenses. Money deducted from an employee's pay into an FSA is not subject to payroll taxes, resulting in substantial payroll tax savings. Who is my Flexible Spending Account with? Will I have a new card? Yes. The new card is from Consolidated Admin Services and is pictured to the right. I received a TASC card. Can I use it? No. The TASC cards are no longer usable. You can destroy the TASC card. The new CAS card replaced the TASC card. What if I had funds left on my TASC card? 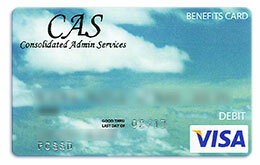 If there were funds left on your TASC card, those funds were transferred over to the new CAS card. What information do I need to know about the previous year’s plan? How do I submit those claims? You can submit claims by going to www.consolidatedadmin.com. There, you will be able to print a claim form for any medical or dependent care expenses. You can submit these claims online as well as upload your receipts or required documentation for those claims. What do I need to know about the current plan year? When you have Medical Expenses you can simply swipe your new CAS card. You can also submit medical and/or dependent care claims by going here, logging in and following the instructions on how to access your benefit account online. They will be happy to assist you with all aspects of your Flexible Spending Account.